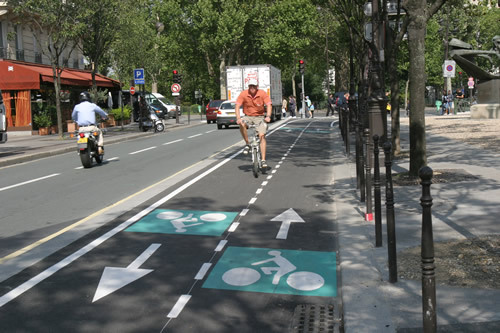 Did you know the City of London has a Strategic Cycle Network? I cycle within and through the City almost every day. It's news to me. Over the coming months, we'll be evaluating each of the routes on the Network and reporting back. "The Corporation is keen to promote cycling as a more sustainable mode of transport and is committed to implementing a pedal cycle route network and also integrate cycling requirements with traffic management schemes." This is from the 2003 Draft City of London Cycling Plan. A largely internal document for City politicians and planners. Note the fact that the City chose to market cycling to its internal audience as 'sustainable' but also note that magic work 'integrated' with traffic management. Roll on a few years to October 2010 and here's that integrated cycle network in action as seen yesterday morning outside City Thameslink, heading west on Ludgate Hill. A friendly road for cycling, as I'm sure you can see. In fact, it's so integrated, that as you cycle along, you can use your bike as a sort of extension of the bus if you like. I'm not going to translate word-for-word but I'm going to focus on the overall message. Yes, the 'sustainability' concept is still there ('écologique') but let's focus on the key concept that Paris is trying to convey: Paris is committed to developing spaces where cycling is prioritised over and above other forms of transport because Paris wants people to get about the city calmly and sustainability. You could rightly ask, so what? It's just a word. But the fact is that word underlies the massive difference between why London is getting it so wrong and why just about every else (New York, Paris, Berlin for starters) seem to be getting it so right. 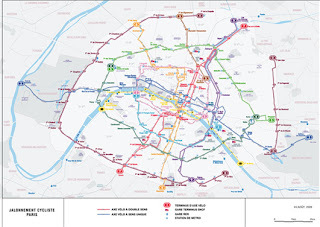 Paris has a strategic cycle network as well. 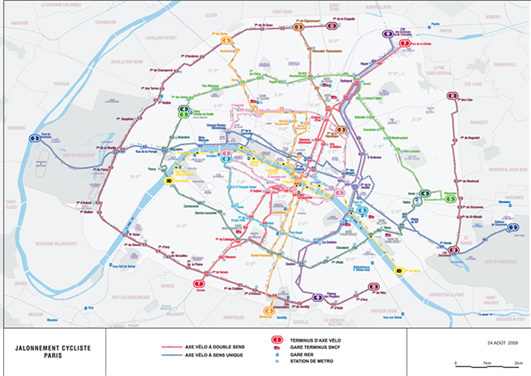 Here's a map of the main routes. And bear in mind that every single one-way street (with some obvious motorway exceptions) is now two-way for cycling as well, so they don't need to mark those routes out as somehow special in the way the odd two-way cycle route is in London. That's just accepted as the norm now. And here's what a cycle network looks like when it's not 'integrated'. Compare and contrast with the City of London, anyone? Really enjoy your blog and agree with your points. If only we had real cycling-friendly leadership in the City! There is so much scope for real cycling facilities with a bit of "sorry we'll 'ave that bit of road, thanks" to motorists. It's just a matter of will. Sadly that will doesn't exist. Ah....wait for it. I'll be reviewing the new Cheapside layout next week. Integration complete with classic pinchpoints and tiny cycle strips!! Thanks for the feedback, though. Nice to know it's not just me that's thinking all this. Any update on the changes at London Wall near Moorgate that you covered a while back? I'm doing that route every day (well via Wood St currently) so keen to see if I'll have a new option. I'll find out next Tuesday and report back. It has been mentioned now twice. Once unofficially and once officially so it's definitely happening, unless the money has slipped into a black hole. Oh! Paris! *Le sigh* Wakey wakey London...! I guess Paris have Haussmann to thank, whereas Christopher Wren didn't get quite the same remit. We could surely do something with the few Parisian bits of London though: I find The Mall very unpleasant. Car speeds feel like 40mph+ and the surface is terrible. HeathMan - the Mall surface is bad, isn't it - I keep thinking I have a flat tire when I'm struggling along it, and then I leave it and everything gets smoother again!